Rocket M2 is a rugged, high-power, very linear 2x2 MIMO radio with enhanced receiver performance. It features incredible range performance and breakthrough speed (150+Mbps real TCP/IP). Rocket M2 combines the "brains" in one robust unit; it can be paired with your choice of AirMax BaseStation or Rocket Antennas. This versatility gives network architects unparalleled flexibility and convenience. 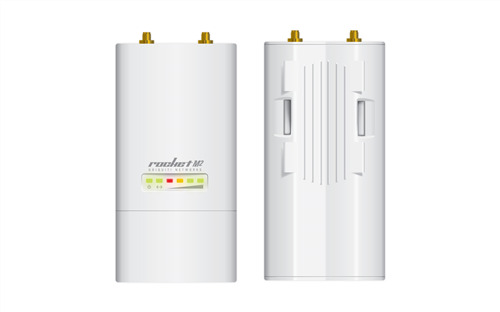 The RocketM2 2.4 GHz 2x2 MIMO airMAX BaseStation from Ubiquiti Networks features a mix-and-match industrial design, that supports speeds of up to 150+ Mb/s real TCP/IP throughput. It is suitable for deployment in Point-to-Point (PtP) bridging or Point-to-MultiPoint (PtMP) airMAX applications. You have the freedom to locate, deploy, and operate the Rocket in this unlicensed band. Ubiquiti's Time Division Multiple Access (TDMA) airMAX protocol allows each client to send and receive data using pre-designated time slots scheduled by an intelligent AP controller. Rocket radios and airMAX antennas are designed to seamlessly work together. Every airMAX sector, RocketDish, Omni, or Yagi antenna has a built-in rocket mount, so installation requires no special tools. Snap the rockets securely into place and mount the antenna, then you have the optimal combination of Rocket radio and airMAX antenna for your PtP or PtMP application. Ubiquiti's Time Division Multiple Access (TDMA) airMAX protocol allows each client to send and receive data using pre-designated time slots scheduled by an intelligent AP controller. This time slot method eliminates hidden node collisions and maximizes airtime efficiency. It provides significant performance improvements in latency, throughput, and scalability compared to all other outdoor systems in its class.